Spirituality tells us that somehow we are already at rest. Spiritual relaxation techniques such as prayers for relaxation help the blocks to our awareness of God's rest to melt away. Rest is intrinsic to our nature. Rest is what we are and where we are in God. Believe me, I know it can feel hard to believe this. I found myself stuck in an ill body for 14 years. My body felt in a constant state of activity - the muscles flicking, the feelings of illness churning. Nonetheless, I had moments of the joy of this peace that passes understanding. Please help me to rest. I place my list of things to do in your hands. 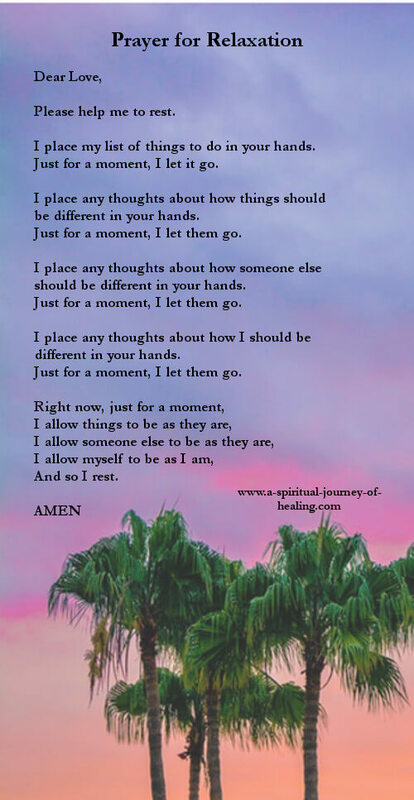 Just for a moment, I let it go. I place any thoughts about how things should be different in your hands. Just for a moment, I let them go. I place any thoughts about how someone else should be different in your hands. I place any thoughts about how I should be different in your hands. a peace that we can touch whatever our circumstances. Dear God, I ask to touch that peace now. I make space for it now. Please come into my heart and let me know your peace. I know that this prayer is heard. I am doing the important task of preparing a path in my mind through which your peace is becoming a reality in my life. I receive your thanks for doing this work. Thank you God for the peace that is always here. This Peace that holds all things within it. I allow myself to be held in this place of Peace. I relax in the arms of your Love. Move to 10 tips for finding inner peace.